We live on the North side in Pittsburgh and our neighborhood is increasingly faced with the effects of crime and decay of society in the city. I'm not sure what all the contributing factors are but I think one may be the effects of passive aggression. Let me explain. There is a growing tendency of a younger generation to use the anonymity of social media to express hostility and aggression in a passive and ultimately ineffective way. Twitter posts like "hey guy on the bus behind me, thanks for singing along with your ipod. I share your love for music" and "person in class behind me, thank you for repeatedly cracking your gum during this test." Instead of actually addressing the person on the bus or the student in class, we make these comments. 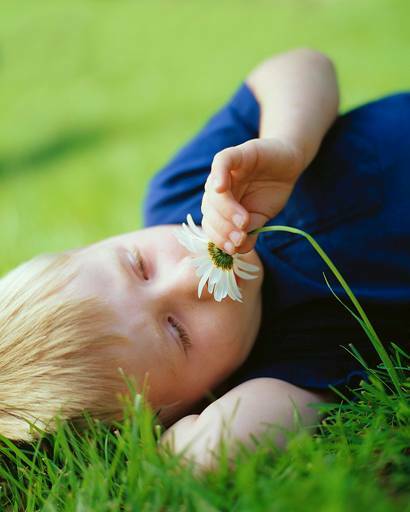 It seems, on the surface, like this is a safe and effective method to deal with irritation. But in reality it goes nowhere. So we do what human beings seem to love to do, we do more of something that doesn't work hoping that it will work better! The effect, I believe, is growing pent-up hostility that eventually comes out in unnatural and unhealthy ways. So when one of our neighbors this week asked some kids to stop playing basketball at his private hoop, they attacked him, breaking a few ribs and causing other harm. I can't help but wonder if these kinds of violent outbreaks are not, at least in part, contributable to society's growing inability to deal with little issues in healthy ways. What if we learned to confront and challenge one another in healthy appropriate ways in the little things? Perhaps our anger wouldn't grow into uncontrolled rage that causes others harm. Your thoughts? It seems like we have sometimes imagine things Jesus said or fabricate things that we think He (should have) said. "God helps those who help themselves" is a classic example. Several times in the last few days I've been confronted with Jesus' words in Matthew 9:37. 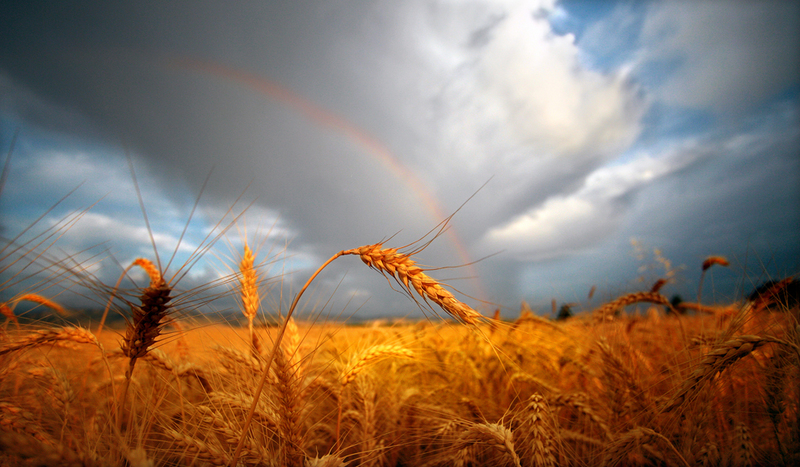 Jesus said to his disciples, “The harvest is plentiful but the workers are few." Now I've been very tempted to imagine what I would like this verse to say. But a conversation with a colleague last week brought me back to reality. He was asking about our approach to ministry at Promise Camp. I said that the most important thing that I do as camp director is recruiting/hiring/training/equipping/shepherding staff. Because I've learned in ministry that no t-shirt, game, meal, campfire, snack, climbing wall, song, Bible study, jet ski, slip n' slide, chant, logo, theme, or gimmick will lead a single child to follow Jesus. The Holy Spirit only uses people do that. So my primary investment had better be in people. See, Jesus didn't say "the harvest is plentiful but the programs are few." He didn't say "the harvest is plentiful but the ropes courses are few." He didn't say "the harvest is plentiful but the churches are few." He didn't say "the harvest is plentiful but the out of this world games are few." Get the picture? He said the WORKERS are few. That's people. We Kingdom workers should be putting the majority of our energy into developing other Kingdom workers. Right? So why are we putting so much energy (and money) into "broken cisterns that hold no water..." (See Jeremiah 2:13)? I have a fantastic privilege in my vocation!!! I have the honor of working alongside and partnering with some wonderful Kingdom-minded people who are sold out in their devotion to Jesus and following the Way. If you don't know some of these folks and their ministries, take a few moments to check them out. They're all looking for financial support. Many are hiring summer staff. All need our prayers. I've been doing the annual college summer camp fair recruiting gig and have been hanging around some great people from The Pittsburgh Project (where I used to serve on staff), and Urban Impact, some fellow North side 'burghers. I've also met some new friends from Urban Promise and Mont Lawn Camp . It is such an honor to serve alongside such great people who sacrifice much in order to follow faithfully. I can't wait to be back with them over the next two days. I also had the chance to share the Word on Saturday with some blessed peeps in Homestead, PA who call themselves 8th Ave. Place. They are a coffee shop based relational ministry and they've been living in community in struggling Homestead to be light in the darkness. And God honors their devotion and their sacrifice. I know it's been forever since I blogged, but I am feeling led to today so here goes. Warning: I'm in one of those moods! Yesterday I did something I haven't done for 6 months...I "went to" church. You see, Carla and I have been on a bit of a sabbatical from "going to" church as we're feeling led to focus more on being the church. Strangely enough, our faith seems to be changing and being more challenged by Him. It's been a blast to really grow deeper in our love for the Lord and sense more and more of His presence and commands, but it has been a bit ironic in that we have done that without "going to" church. The concept of "going to" church isn't found in the Bible. At all. Ever. In fact, "church" is not mentioned much at all. It isn't even alluded to. Living together in obedience to God, however, is written all over the place. So that is what we have been praying through. (We have been doing a lot of reading so comment on this post if you're interested and I'll give you a little bibliography.) What we have been doing is living more for Him and doing so with the people God has placed in our path right now...the church. We've been meeting in homes and letting Christ truly be the head of our times. No set agenda, just His spirit leading, teaching, convicting, challenging, comforting, changing. So yesterday was a big step for me. I "went to" a large suburban Pittsburgh "church" which, in my mind, is a really large beautiful building. My time there was a confirmation that God is leading us right now. The "service" (why do we call it that?) lasted one hour and 20 minutes and was perfectly orchestrated. Beautiful computer controlled moving synchronized stage lighting, and "worship leaders" standing with their toes right on the tape in the proper place on the stage. The "message" was 50 minutes in length...30 minutes until Scripture was really even alluded to and 40 minutes until one verse was even read. There were two prayers in the "service"...one at the beginning and one at the end. There were two songs, the first to "lead us into the presence of the Lord" and the other to, I suppose, take up for the awkwardness of passing the offering bags on a stick. The entire time, I was thinking "how is this the church?" And it isn't just there, but this idea of compartmentalizing our faith into a neat, timed, comfortable package just makes me want to jump out of my skin. (Note: I have been doing some real soul-searching and forgiveness-seeking for some of what I did as a pastor...thank you Jesus for your grace toward us!) The fact that the place was very empty compared to the dozen or so Christmas services they had is another weird and telling piece. As an unchurched friend of mine said a few years ago of this church (and a few others whose mailing list he must be on) "why do they only want me to come at Christmas? I can honestly say that I haven't missed "going to" church. I do long for the church, however. I long for people who live lives together in the mess and grace of following Jesus. I do long to be with people who's sole desire is to know and follow the living God. I long to live life with people who see that as happening in less scheduled, structured, formatted, and programmed ways. I already said it, but I'll say it again...I long for the church. It has been a while since I've blogged, too long to be sure. And it will probably be a while until I'm back. I am the Camp Director for Promise Camp of Family Guidance and I'll be moving to camp tomorrow. I'll be embarking upon an intensive 2 weeks of staff orientation and training followed by 4 weeks of trying to run a camp ministry for at-risk kids. Please keep me in prayer as I serve the Lord in this way. Keep our entire staff in prayer as this is not your average camp. The summer is intense and the kids we serve can come with all kinds of baggage. I am looking forward to a fantastic summer and if I get the chance, I'll try to update you with stories of the journey. If you don't live around Pittsburgh, you may have no point of reference for this blog post. In Allegheny County Pennsylvania, there is a huge furor over property tax reassessments. Somebody petitioned the courts a while back to force the county to reassess properties. The county complied, and then began mailing out the new assessments. The assessed value of some Pittsburgh properties has gone up 400% and more, and believe me, the owners are not happy. Because of the kind of inner city ministry I'm involved with, there is a lot of talk about "justice." We believe that God has called us to act justly in the world and to do so on behalf of those who don't always have the strongest voices. So on the surface it seems like a justice issue that so many taxpayers are up in arms about their new assessments and the extra taxes they may have to cough up because of it. And my first reaction is fight because, for me and Carla, our newly assessed home value has increased by over 30%. Justice is to fight for a lower assessment, right? However, as a Christian, I'm called to act justly....always. That means even when it doesn't benefit me. That means even if it directly harms me. Right? Because our newly assessed home value is actually right in line with what our home is worth on the market. Which leads me to ask the simple and difficult question: Would I be willing to fight for a higher assessment if our assessment was considerably below fair market value. And because our assessment is actually fair, it really isn't justice at all to fight it, it's just not fun to accept. Do you see the issue? I feel called to right the wrong, to justice, if I am going to have to pay more. But isn't the real test of my justice mettle to see if I would fight to pay more if paying more was actually correct?! What say you? Have you read this book? The subtitle is "A Black Evangelical's Inside View of White Christianity." I just finished reading it on my Amazon Kindle (thanks mom) and I must say it has been very thought provoking, inspiring, and challenging. I have had some assumptions debunked and have had some misconceptions put right. I have also wondered what others who have read the book are saying. Any thoughts? I have a great job...mostly because it isn't a job, but a ministry. I have the awesome pleasure of being able to serve the Lord by serving folks in need in the inner city. Here on the North side of Pittsburgh, we are blessed with so many wonderful things. We are also plagued with some poverty and the associated issues that go with it. But in the midst of that, I get to live and work here...helping (I hope) to bring about the Kingdom "on earth as it is in heaven." And in so doing, I am blessed to be able to live and work year round with some of the greatest people I've ever been blessed to know. But I think my favorite thing, and my greatest blessing, is the 70 or so young people that flood the North side each summer to serve on the staff of The Pittsburgh Project. Their jobs tend to be harder, more thankless, and more stressful of any of our year rounders. And yet their smiles and joy in serving tend to be greater too. A coincidence? I think not. Jesus said numerous times in numerous ways that the greatest of us would be the servants. And these young people exemplify that better than anyone I know. Over the past few days, Carla and I have been dabbling with decorating the beautiful home that God has blessed us with. We are humbled every day at how He continues to shower us with His grace, love, and abundance. And we want to always be people who are thankful, and people who share. Three things have smacked me in the face this week that remind me of that truth. First, a volunteer of ours at The Pittsburgh Project had a new grandson born yesterday, but with very serious health problems. Seeing pictures of this little guy struggling for life makes me realize how much the world needs the healing touch, the hope, and the peace only the Lord can bring. Then I saw an article this week comparing the excesses of Christmas in much of the Western world to the poverty in much of Africa. Having lived there for a few years of my life, the stark differences between the two worlds I have inhabited reminds me of how much I need to be someone who shares. Then this morning, I was walking past our Middle School bulletin board and the kids have been encouraged to write on the board what they want for Christmas. There were a few things like iPads and clothes and such, but a few of the responses really kicked me at the core of my soul. One student wrote "My Dad" and another wrote "I want my brother back..." I realized how privileged I have been to be nurtured in a family that has not been ravaged by the realities of inner city poverty and crime. And I realize, again, that out of my abundance I am called to give. Well, I am reconsidering my decision to end my blog ad infinitum. And that is partly because of one of my most longtime, faithful readers. Her name? Well, I call her mom, mother, jude abood, and a few other names that I can't mention on this family-friendly blog. Those names are only uttered during not-so-family-friendly games of Pounce, a favorite full-contact card game we play. Today is mom's birthday so I thought I would honor her with a few, albeit rare, kind words. Thank you for encouraging me. You encouraged me to use my gifts and to recognize when I didn't have gifts to use. Thank you for supporting me through failed attempts at things like Little League and other short-lived (thank God) athletic attempts. Thanks for dragging me to numerous activities...band and piano lessons and youth group and cub scouts and drama practice and forensics and crap like that. Thank you for appreciating me. Thanks for the black raspberry pies that often await my announced visits (although it does seem like Felicia gets more food when she visits). Thank you for putting up with my sisters and teaching me how to do the same. Thank you for loving and caring for dad. Thanks for softening enough to let us have dogs (and even enjoying a ride to Keiper's with Harley in the back seat!). Thanks for making holidays special and for often making everydays seem like holidays. Thank you for being you. I am thankful to God to have been born into our family. I hope you enjoy this, your special day. Happy birthday mom, and many happy returns. I will no longer be blogging. If you want to read a past blog, read it now because I'm deleting it next week. Thanks for being a faithful follower. "Dance With Who Brung Ya"
Our pastor is preaching a series entitled "Follow Through." We've been working through Haggai and Malachi and learning about how followers of Jesus follow through and what leads us to shrink backwards. We've been thoroughly enjoying the preaching and have been greatly challenged. So this week, one comment that stuck out was when Gary said that we should "dance with who brung ya!" In other words, when you go to a dance with a particular person, you don't dance with someone else. He went on to expound about how God has brought us to this dance, but we quickly abandon him for more "attractive" partners. We've been encouraged to return to our first love and dance this dance of life with the Lord who has brought us into new life. Carla and I have been discussing about how God has brought us to this dance and what He's brought us from. We've also been humbled about some ways we have sought different "dance partners." What about you? So I got a new cell phone the other day...with Sprint so that I can actually use it in my house and where I work. What a concept! Anywho, when setting up the security settings at the store, they asked me to choose a security question. One of the options was "your first car." That got me to thinking about the ole' '64 Plymouth Valiant 4 door I bought back in '83. I bought it for $300 from Mrs. Wadsworth down the street. Her husband Bob and I sang bass in the church choir until he passed away. She didn't need two cars so she sold it to me. I'll never forget that day. When she opened the garage, I thought I had seen the most beautiful car in the world! It had chrome bumpers (you younger readers can Google "chrome" to see what that is) and grille. It had 102,000 miles on it, and a little rust, but to me, it was brand new. I drove that car for the next three years...using it more as a truck at times. My horse saddle fit nicely over the bench front seat and the back seat and trunk could haul quite a few bales of hay. I hit a deer with it the first Fall I owned it, but thanks to Dad and the junkyard, I got it back on the road in no time. I LOVED that car...and I thought at that moment, "I wish I still had it." Lord, help me to live for you in this day, thanking you for all that's past, but more so looking forward to what you have in store next! Ah, yes, Facebook. And more specifically, Facebook "friends." If you read my previous blog about friendship and fellowship, and if you have any Facebook friends, you may have discovered that term is sometimes a misnomer. Let me illustrate. A number of years ago, Carla and I loaned nearly $1,500 to some folks in a church we were serving. They were a young family with three little kids and their house was going up for Sheriff's sale. The church had helped them to the point of fatigue, so they approached us. We agreed to pay their tax bill and they agreed to pay up back when they received their income tax refund. Well, to make a long story even longer, about six months later, they gave us a check for $500 and the promise that more was coming. That was the last we ever talked about it. Carla and I moved on and seldom even speak about it. It's cool. You win some, you lose some. Except a few weeks ago, this person attempted to "friend" me on Facebook. Really? Facebook friend? Now I know you're thinking that they're attempting to send us our money. Not so much...our new address and information is well published. Needless to say, I "ignored" their "friend" request. PS: Yes, I will agree to be your Facebook friend, even if I don't know you...even if I don't like you...if you'll give me $1,000! Thanks in advance! So this has been rolling around in my head for some time now. A few months back, I participated in a Bible study at our church. One of the weeks, we focused on the role that fellow Christians play in the life of a believer. One of the elders in the church put the curriculum together and, in it, he said something very profound and challenging. He stated that God created friendship for our comfort. But he created fellowship for our true growth. Wow...deep stuff, and I'm thinking very true! 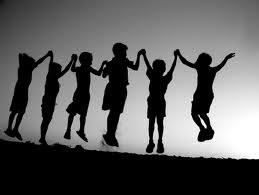 We all need friends....people with whom we can laugh and cry and play. Friends are for fun and friends are to minister to one another in times of need. I'm so thankful that I've been blessed with a few true friends. I enjoy them, and I think they enjoy me! Friends are good, and friends are good for my comfort. But we also need fellowship. And I'm realizing as I've been thinking this through that I have far fewer people in my life with whom I'm in fellowship. Besides Carla, I won't name them here. But these are the people who are not only friends, and not just friendly. They're the ones who seek me out when I'm not going down the right path. And they're the ones who ask me to show them the same things. They're the ones that inspire me to grow up, and the ones who will let me inspire them to the same. They're the ones who don't just comfort me when I'm afflicted, but afflict me when I'm comfortable and vice-versa! So I'm thankful for my friends, for sure! But I'm especially thankful for my fellowship partners...those that help me to be a man more like Jesus!!! ...so this is all I have. I learned, while going to the funeral home today, that the purpose of a suit coat is to hide the wrinkled shirt underneath. Just a few quick lines to say how blessed I am at the beginning of a new year. First, we who call ourselves The Pittsburgh Project started out our new year together with a day of prayer and seeking the Lord together. How awesome is that? What it is a blessing it is to belong to such a group of Kingdom-hearted people! Then last night I was able to attend the first of four nights of prayer and fasting at Hosanna Church. There were about 30 people gathered for a time of praying in the new year for four consecutive evenings. How awesome it was to spend an evening with other "saints" as we sought the Lord in repentance and restoration for how we have behaved as Christians and as a church. I can't think of better ways to live out "happy new year!" So I guess it's been like a perfect storm of things leading up to the authoring of this blog entry. Unfortunately, some of the strongest illustrations cannot be included here because they would certainly be too offensive (mostly, because they would be too personal toward some). Let me start with the church and Christmas. Is it just me, or did Christmas suddenly become about us? And I'm not even talking about the worldly perspective, but from that of the church. I saw numerous church signs, websites, and some tweets/facebook updates stately loudly and proudly that "Jesus came to earth for you!" It must have been a mantra of one of the leading church growth gurus this season...you know, those that I have long unfriended on facebook and stopped following on twitter and reading their "leadership" canons? I say this because I saw this message (or a reasonable facsimile thereof) in so many church circles this year. Now it is factual that Jesus came to earth for you. He came to save you, and me, and the world. But the truth is that He came for Him. You see, a faithful reading of Scripture will prove that EVERYTHING God does is for Him. Everything. So when He sent His Son, it was ultimately for Him. Hey, we benefit, to be sure. But it was not for man that God became flesh and dwelt among us. But it was so we could see HIS glory, not our own. A second event that swirled some clouds to form this storm within my soul took place at a public place. I ran into somebody who I would have considered a "friend" some years ago. I haven't seen this person in quite some time, and in the ten or so minutes we were able to spend, I heard a lot about him. His new job and all his new responsibilities and office and stuff. And then he left. He didn't ask about me. I don't know why I'm surprised. He is a Christian and must have heard the message that Jesus came to earth for him. It sure sounded to me like that was pretty much his sole focus...himself. And then there is the book. It was the one book I asked for Christmas (besides a NASB version of the Bible so I can follow along more closely as my pastor reads) and it is entitled "Radical." It was recommended by a friend...one who asks about me and who focuses on things other than herself outside of Sunday morning. She is someone who gave up a lucrative career to follow her calling. She lives in a rented apartment and buys her clothes and furniture at the second-hand store so that she can be faithful to living a radically different life for Jesus. It kind of makes me wonder if she made it to church this Christmas, at least in many locations. Because I think she missed the memo that Jesus came to earth for us. She is living as though He came to earth for Himself and to draw all people to Himself and that means she must live differently. So Carla bought me the book and I have finished reading chapter 4 so far. And the book lives up to its name so far, because in it the author is talking about how Jesus came to earth for Himself. He came to transform lives so that transformed lives would live for Him and bring others to Him so that they can live for Him. Finally, there is "our" church. Hosanna has been around for 20 years. It was planted by the same guy who is pastoring it still. But Hosanna must have missed the memo, because the church doesn't seem to think that Jesus came to earth for it. Hosanna isn't a "successful" church and Gary isn't a "successful" pastor, at least in the eyes of the run-of-the-mill Christian church in America today. After 20 years, they should have thousands in the seats and a $150,000 sound system and baseball and soccer fields "for the kids" and a coffee bar and at least 3 services on Sunday, a few on Saturday, and numerous the week of Christmas (so that people can learn that Christmas is for them.) Gary should certainly have a title like "executive, senior, or lead" by now and should have a staff of many. But no. Gary is bi-vocational and for 20 years while pastoring this little church has cleaned windows to pay the bills. The church building was paid off last year...$150,000 worth. There are probably 100 people there at the weekly service. There is a part-time secretary. I'm not sure who cleans the church, but I know it is very clean. The worship team isn't perfect and I don't feel like at the Benedum Center for the next great performance. The sound systems cracks and frequently makes a noise that can only be described as like a loud fart. And yet this church is raising $30,000 to send to Liberia. (That is in addition to what four individuals coughed up on their own to go and support the faithful use of these funds to build a school so 200 kids aren't cramped into a house.) Nearly every week, someone is introduced as giving themselves to Jesus and a life of service to Him. There are radical testimonies that are frequently shared. People are living very different lives, and not unto themselves. The Kingdom is coming to this little slice of Pixburgh. So what's my point in all of this? Maybe some contrition for buying into "it's all about me" mentality during the years of my pastoral ministry. Maybe some sadness of heart for the fact that we have exchanged the truth of the gospel and its radical message of transformation and unabashed Kingdom living into a trite story about our own comfort. Maybe some regret that I didn't take a bolder stand and have a fuller realization at times that life isn't about me. And then the hope...that I am part of a church, nay, a movement of transformed "folks" who are out to, yes, save the world. That I have saved nearly $700 already for my trip to Liberia...whenever God opens that door. For a job where I can go live the Good News to people who sometimes don't have enough good news, let alone Good News. For a renewed sense of awareness and for a few Kingdom friends (like the one I share a bed with and the one I regularly meet for coffee and the one who suggested the book and the one "unsuccessful" yet faithful pastor who happens to serve (and I do mean serve) with the people of Hosanna and the ones who call themselves The Pittsburgh Project) who have this same burden and excitement and reckless abandon. I praise you Lord. May my life, my marriage, my work, my recreation, my resources, my friendships, my struggles, my joys, my conversations, and even my Christmases....be about you and you only. Amen. Merry Incarnation, er, I Mean Christmas!!! Merry Christmas everyone. At least that's how Christians often express their greetings in this season. And why not? I mean, are we not celebrating Jesus' birthday? Well yes, it's true we celebrate the birth of Jesus Christ at Christmas time. But even more meaningful is the fact that we celebrate the Incarnation. Ya, that's a big church word but it really means that God came to town. He revealed Himself. He made Himself known in the best way we can grasp it, as a person. My favorite Biblical rendering of the Christmas narrative (apart from Linus reciting Luke 2 from the ole KJV) is from John 1. No, there are no mangers or angels or shepherds or little babies. 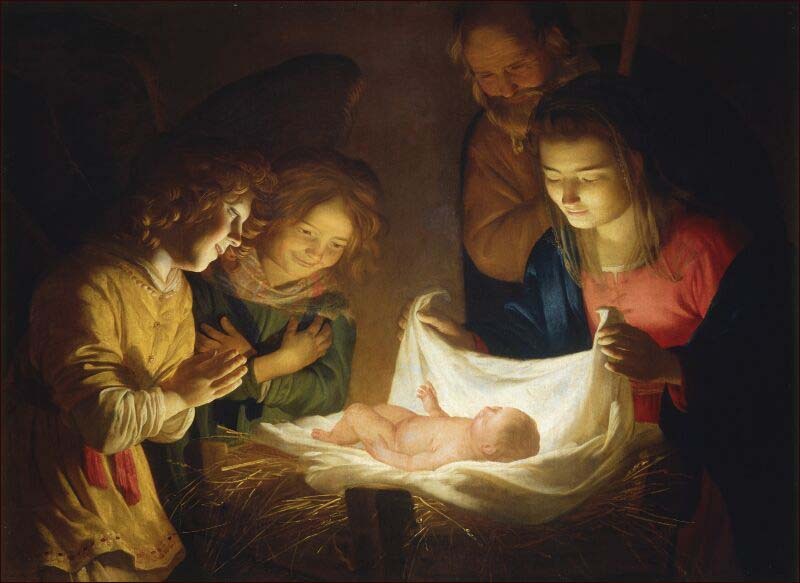 But there is the simple, yet most profound, explanation that "the Word became flesh and made His dwelling among us." So, yes, at this Christmas, I wish you a Merry Christmas. But at this Christmas and throughout eternity, I wish you a Merry Incarnation...and understanding that the very being of God has been made known in Jesus Christ. O come, let us adore Him! 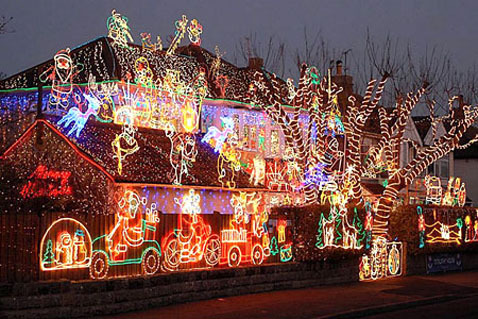 How to Decorate Your New Home for Christmas for Less Than $650,000! So today I goes to get a couple of feet of decorative white chain and a swag hook to hang a plant for Carla. I went to our favorite hardware store...Bellevue Hardware. Unfortunately, they were sold out of the chain, which was priced at $0.24 per foot. So I was forced to go to another "big box" store which shall remain unnamed for legal reasons. After finding the swag hooks in the lighting department, I ask a friendly orange-aproned sales associate if he could help me. He said, and I quote, "only if you need help with shelves." So I ask someone where the decorative white chain is to go with my swag hooks. They tell me in hardware, which is at the other end of the store. So I goes to the hardware section, find the decorative white chain, and ask the sales associate who is standing literally 4 feet from the chain if he can cut a few feet of it for me. And he says, and I swear I'm not making this up, and I quote, "I'm not certified to cut chain." And that's it. So I politely asked if he could find another store employee who was schooled in the art to come assist me. After a short wait, a board certified, card-carrying member of the white decorative chain cutters union appears to cut my 5' feet of chain. He handed it to me, and started to walk away. At which point I says, don't I need an SKU number so they'll know to charge me $0.96/foot for my chain (you'll notice that the price is just slightly, LIKE FOUR FREAKIN' TIMES, higher than Bellevue Hardware)? He says, oh yeah, and scribbles the SKU number on a piece of scratch paper with a bunch of other writing on it. I went up front to pay, and when I handed the cashier (I'll call her "Jan", mostly because that is what she had written on her orange apron at this unnamed big box hardware store) the scratch paper and she enters it in, she says "that number isn't right. What's the right number?" So I said "I don't know...I didn't write the number down...the certified Master Decorative White Chain Cutter did!" After a call to hardware, which BTW was a wrong number, a line of about 17 people waiting behind me in spite of the fact that I'm telling Jan it's $0.96 per foot...can't she just key that in..., the manager or someone in authority came over to help. (I know they were an authority figure because they had an orange apron on.) Instead of just looking up the price, she decided it was a great time to school Jan in the fine art of how to search for an unknown SKU number in the 'puter system. I thought that was a great idea, because Jan is probably now a certified SKU number looker upper, or something. After only six hours, I was able to walk out with my chain and hooks, although I must admit, it felt more like A BALL AND CHAIN!!! Anyhow, I'm glad I missed church last week because the sermon was about complaining and since I wasn't there, I'm allowed to complain. But in order to reign it in a little, I've decided to keep the name of the store a secret. Thanks for letting me rant. So the other day I was working with a couple of groups of college student volunteers at TPP. I love working with groups like that because you meet people from around the world. Perhaps most interesting at times is the different dialects I experience from across the US. Welp, I said to one group "let's weed this hillside up to those jagger bushes." And one student, not from Western PA, looked at me and said "what?" So I repeats myself and said "just go as far as those jagger bushes." At which point she said "what's a jagger bush?" Now what ensued was a discussion that led to a heartbreaking revelation: "jagger bush" isn't a real term. It's a colloquialism of Western Pennsylvania. People from other places don't call them jagger bushes. They call them thorn bushes, or they call them by their proper names. Since stepping out of the pastorate and into a more "boots on the ground" ministry earlier this year, Carla and I have been searching for a church. Our desire was to find a church in our community that really represented us and our neighbors. We wanted to find a church that was alive and where people were real. We wanted to find a church where we were challenged to grow and serve in crazy new ways. We wanted to find a church where people were friendly to outsiders and to one another. We wanted to find a church where Sunday morning was a time to honor God and a springboard to a life of service and ministry. We wanted to find a church where people shared life with each other and with a lost and hurting world. 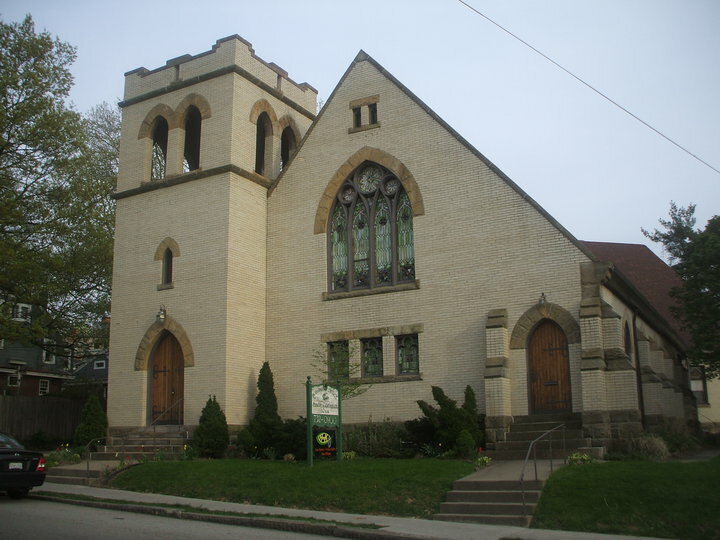 We wanted to find a church that was diverse...ethnically, socially, economically, generationally...because that is the reality of our Brighton Heights neighborhood. We wanted to find a church where the lost, hurting, and dying were finding a truly new and incredible life in Jesus Christ. We wanted to find a church where the worship wasn't perfected by practice, but practiced as an offering to God, and therefore perfect in His sight. We wanted to find a church that understands the Kingdom and is living as a true light in the community. We wanted to find a church where the preaching was inspired before being inspiring and where the message was captivating because it was truth. We wanted to find a church that gave sacrificially to see the Kingdom come at home and around the world. Quite simply, we wanted to find the perfect church!!!! So we visited churches...many of them. We visited some that were very close to our house and some that were not. We visited churches that were big and some that were small. We visited churches that were affiliated with a denomination and some that were as independent as they come. In our search, we had some pretty humorous experiences (remind me to tell you of the church with the marble communion table with the chiseled inscription "Come Unto Me" and a fence all around it....I swear I'm not making this up!) and some that were just downright discouraging. Some churches we went back to a few times and some we walked out of before the service even ended. Some churches we really liked but weren't close or there were other minor reasons. But finally, I think we've settled into a church home. Indeed, the characteristics that we searched for and that I listed in the first paragraph really seem to exist in this little church in Brighton Heights. It is called Hosanna, and we are loving it. Hosanna is an expression of praise (and originally meant "Lord, save us") and we feel like it lives into both of those meanings. It is not a perfect church (and if it was, it isn't now 'cause I'm there!!! ), but it is the perfect church for us. We walk there holding hands together, get to worship together side by side, and get to walk home hand in hand with a stopover for an awesome Panini at the Brighton Cafe. Thank you Lord for leading us to the Northside of Pittsburgh. 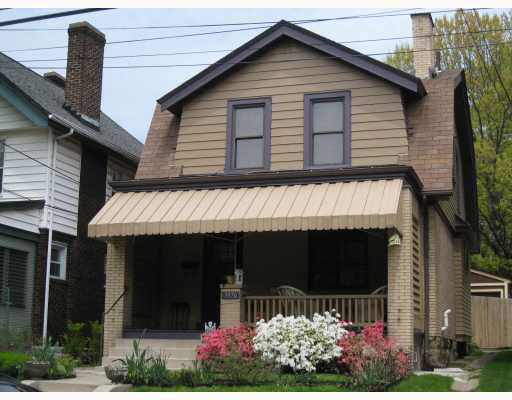 Thank you for a beautiful home of our dreams in a great neighborhood. Thanks for a great ministry opportunity at The Pittsburgh Project. And thank you for our wonderful new church home. May these things continue to come together so that our lives and every aspect of them can be an offering to you! So on my way home from The Pittsburgh Project today, I stopped off at the local thrift store. Now it's called the Red, White, and Blue Thrift store on Ohio River Boulevard but my neighbor calls it "The Boutique on the Boulevard." Sounds much classier that way! Anywho, in the midst of my buying two long sleeve t-shirts and a vase for our hall tree (all for $5! ), a guy who I'll call "Dan" starts talking to me. (I'll call him Dan because he said "Hey...what's your name? My name is Dan." He said to me "Wow, you keep it up, bro." I said "keep what up?" And that's when the conversation started. He told me that it looked like I was a man at peace. He said that so many people are running around in this world all bothered by the stuff life throws at us and he could tell by my face that I was living a life of peace. He said he thought I had figured out a way to not let the stresses of the world get me down. Well, I hope he's right. I mean walking a life of faith in Jesus has really changed my heart. The things I once worried about I find I worry about less. The more I surrender to Him and keep my heart focused on Him and His purpose for me, the less I find that I'm stressin' about the stuff. You know, the stuff? So thank God for the peace. It sure does pass my understanding. And I hope not only my new friend Dan but others can see the peace on my face...'cause it sure is in my heart! Yesterday I was working with a group of volunteers from a local college. Almost all of them were college freshman and through the course of the day I asked them what they wanted to do when they grow up. I didn't hear too many clear cut answers, but maybe I shouldn't be surprised. First of all, so few people actually stay in the same career field these days. I personally think this is a good thing in that we have permission to dream fresh dreams and do new things with our lives. That is what walking by faith is all about...to understand that God has big new plans for us around each new corner. When we get into a complacency, almost any complacency, we are in danger of following His will for our lives in the past. I believe the Lord is always calling us to some new plane (or helicopter), and that means our lives should be in a constant state of flux. I also think that the younger generation sometimes feels forced into going to college. This puts some in the position to make decisions about their future before they know enough about themselves to make that call. I think that was probably the case with me in some ways...I went to college because it was the thing to do for people with grades like I had. I don't regret it, and never have. But I think the healthier (and cheaper) approach might be for some to simply get gainful employment after high school to discover more about who they are. Then when they figure out what they like and dislike, what their true strengths and weaknesses are, and what their calling from God may be at the time, they can make decisions about future educational pursuits or career choices. So while Carla was at work and there was a lull in my homeowner repairs, I went out for a quick 180 mile ride on the Harley. Now in the middle of the afternoon in the summer on a country road, out jumps a deer. Luckily, I was paying attention and was able to avoid hitting it. 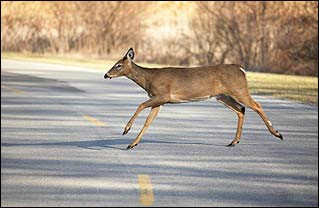 (Non-motorcyclist factoid: If you hit a deer on a motorcycle, it hurts you as much as it hurts the deer.) But then, I settled back into my comfortable ride. Then alas, some 25 miles later, another deer jumped out. This time, I whipped out my camera and snapped this photo so I could blog about it. jk lol rofl lmao omg lmnop. But seriously, it got me to thinking about a conversation Carla and I had this morning about how God is always calling us to be uncomfortable. He wants us to be constantly stepping out and taking Kingdom risks. He wants us to be living radically different lives than the world around us. And this always, ALWAYS, causes discomfort. So are you settled into the ride of life? Are you comfortable with where you are? Then I ask you, do you think Jesus is?